Perfect apartment, perfect location. Enjoyed every minute. Especially loved breakfast on the balcony! Geräumig, komfortabel, sauber. Genau das, wonach wir gesucht haben. For those making a temporary move to the Catalan capital, this spacious two bedroom apartment in Barcelona is the ideal base for your time in Gaudí´s city. The area offers easy access to various forms of public transportation, making it easy to get around town. The apartment enjoys a warm yet simplistic design with comfortable furniture throughout. The large living room has a comfy double sofa bed, and a TV, ideal for kicking back. For those who need to get in touch with friends or family, an Internet connection is also available. Be sure to make the most of the Spanish sun on the balcony! The apartment has two bedrooms, both furnished with a double bed, meaning that this apartment can accommodate up to six people in total. The fully equipped kitchen makes it easy to create your favorite dishes, all in the comfort and privacy of this ideal home-away-from-home. 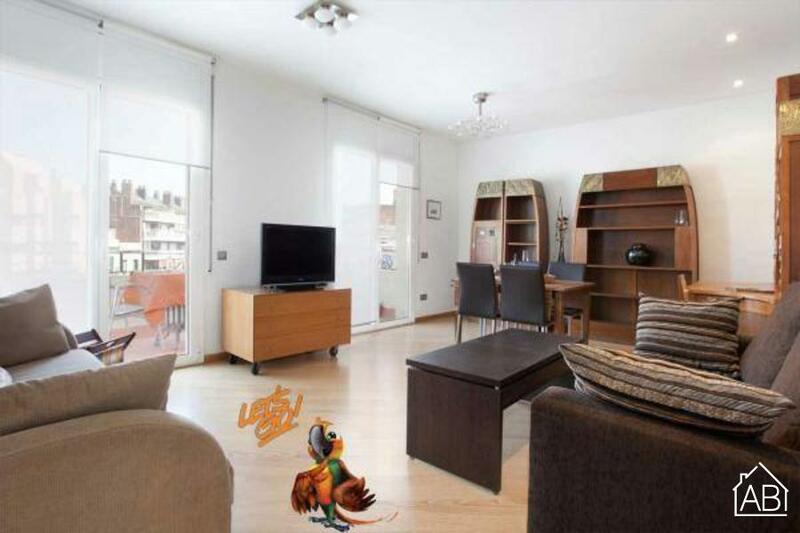 Whether you are making your way to Barcelona for an extended vacation, or just a temporary change, this apartment in Barcelona is a wonderful choice, all year round!